We have 2 x 2 bedroom cottages on our farm - Each two bedroom cottage can accommodate a maximum of 5 people. Ocean Views, wood fire, rc aircon, fully self contained, 280 acres of beautiful farm, with a passing parade of farm animals, peace and quite and the comfort of our cottages. 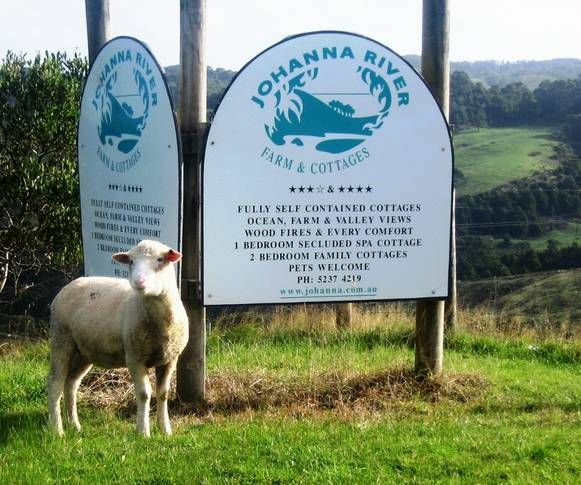 An ideal base from which to explore all the magic of the Great Ocean Road and Otway National Park. We also have a one bedroom cottage and a one bedroom spa cottage on our farm. Tariff is per cottage - and calculated on number of people (depending on length of stay). A two night minimum stay applies throughout the year. Minimum 3 nights and 7 nights may apply during peak holiday periods. Each two bedroom cottage is fully self contained, fully equipped for comfort and privacy, with wood fire heating, reverse cycle air conditioning, queen size master bedrooms, laundry, kitchen, and beautiful ocean and farm land views. We welcome families - including the family pet (by arrangement) and couples looking for a romantic, secluded getaway. We had an awesome time at Helen's n Julian's farmstay. The kids enjoyed it so much due to the couple's warm hospitality. Not forgetting Zack for being such a great host. Definitely will recommend to frens n make a return to the farm. What a beautiful setting! Had a wonderful relaxing week with beautiful scenery and lots to do. Thank you to our very hopsitable hosts Helen and Julian. Would love to return!